With an average of 41 away games per season, there's no doubt that pro ballers spend a lot of time on the road. 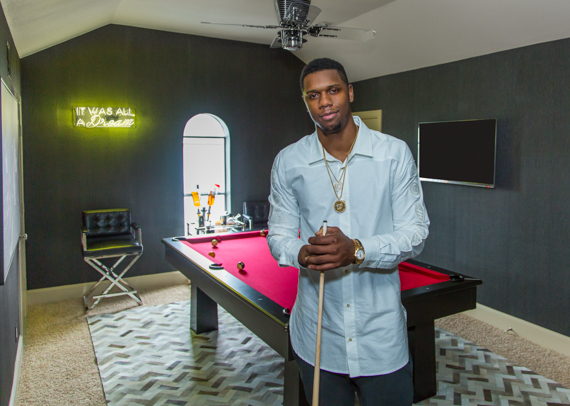 Sleeping in a luxe hotel bed has its perks, but after a recent car accident, Houston Rockets player Terrence Jones found a whole new appreciation for his home and family. The accident "really made me feel more blessed just about where I am and what I get to do," Jones says. The busy schedule of an NBA player doesn't allot much time for designing spaces, and Jones had left a room in his Houston home empty for over a year. He finally turned to Laurel & Wolf designer Lucinda Pace who coached him through the process and transformed his blank canvas into a killer man cave. His one request? A pool table. Pace crafted a clean and modern space using rich materials like chrome, lucite, and ebony. "Terrence and I agreed that the man cave would encompass a color palette in the vein of the team colors of the Houston Rockets," she remarks. To see more photos of Jones's man cave, check out Laurel & Wolf magazine and make sure to catch the Rockets playing in the NBA Playoffs.